Canada West has gone from the ridiculous to sublime. OK, can you come up with a better summation for the gong show in Canada West? A second team has been stripped of victories and is out of the playoffs. "Should the Bisons forfeit the two wins they earned, it would take them out of a playoff position and move Regina up to fourth and Alberta to third. This would mean the Huskies would face the Rams at home on Saturday, while the Golden Bears would visit the Calgary Dinos.
" ... as Canada West has taken wins away from Simon Fraser for using an ineligible player this year, it appears a similar decision is in order for this infraction. The powers that be in the CIS and the Canada West conference will have a difficult decision ahead of them if they decide to forfeit Manitoba’s wins Hardy was involved in, as the Bisons were awarded a win in a game they originally lost against SFU because of an ineligible player. Who wins a game where ineligible players were on the rosters of both teams? Also, does the timing of the self- disclosure of the ineligible player, which apparently was after the game against Calgary on October 10, weigh in Manitoba's favour in the eyes of the disciplinary bodies? Regina QB Marc Mueller apparently already posted a "reborn baby" message on his Facebook page. Again, not playing lawyer, but it seems pretty cut-and-dried. One question is how people look at Manitoba's program, depending in how this shakes down, of course. In all honesty, there are about 2,000 football players in CIS at any time (75 players times 27 teams). NCAA schools have the budget for a "compliance officer" who looks after all these things, but in Canada, you wonder if some schools are limited to taking a player at his word. Seriously, Hardy was a fringe player, who knew it was the same guy from so many years ago? What might happen to that SFU game? It surely can't go back to being an SFU win, can it? In the end, how can one team that used an ineligible player get a win from that game, and the other gets a loss? And the best part? UBC could keep winning even when they've finished playing. Well, we don't have the answer to that. Honestly, what's to say they could not record it as a double default? Neither team complied with the rules, so it goes down as a loss for both. It's happened once in my experience. It was 1994-95 and there was a labour disruption that kept two high schools in the Kingston-area league from playing games. It happened during that span they had a basketball game vs. each other, so it went into the books as a "double default." Neate's got it - it's a double default and both teams lose. It happened in the OUAA back in the early 70s. York and Laurentian (I believe) played a football game where both schools used an ineligible player. The win flipped from one to the other in one week, and then went to a double default a week or two after that. Well it doesn't look good for the U of M Bisons. How did they not see this? he was suspended in 2001 for 4 years. Here is the orignal Quote " Sanctions associated with this infraction are four years of sport ineligibility effective October 24, 2001. So he played Last year, so wouldn't he be done his university already? Man how old is this guy 30? Give me a Break, Man it makes me sick when i see 29 , 30 and older players playing university ball! Play pro at that age , get on with your life. Well it looks like Dobie and his great recruiting may have screwed up. The guys I feel sorry for are the rest of the Bison players who worked hard all season to make the Play-offs, The players and Coaches on the Bisons are the one who lose here which is Sad. The Simon Fraser game should be no points awarded to either team and the UBC and Alberta games should be over turned which is the right thing to do. So what happens to the Bison Program? 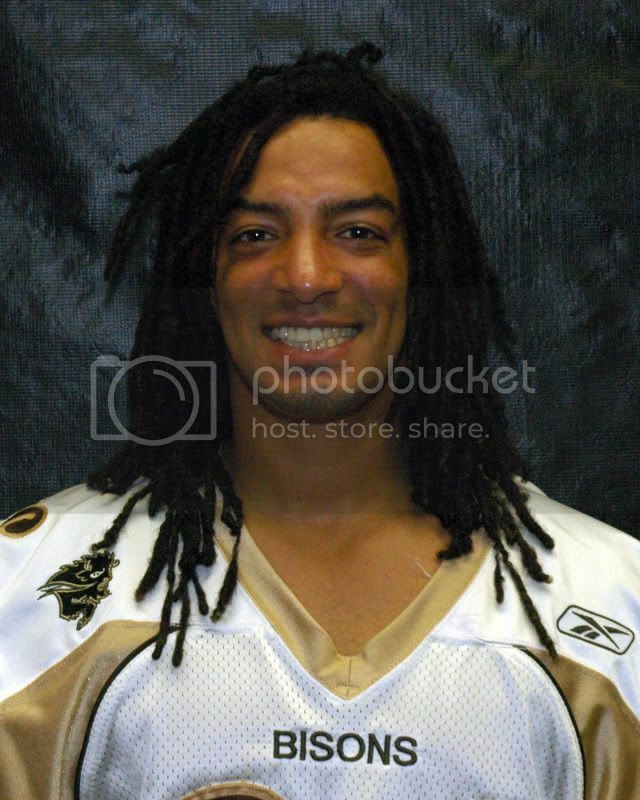 Did this player play on the 2007 Vanier cup team? if so does the vanier cup get taken away? How does this player get back on any Roster if he was suspended for 4 years Ineligibility and why now? why didn't they catch it earlier ? he played last year? again hopefully he didn't play in 2007 when they won the cup. Man it's lousy for the rest of the team, they were starting to come along. But RULES are RULES. Just have U of S and U of C play for the championship - no one else in this conference deserves to play in the playoffs whether it be due to forfeiting wins or just flat out being bad football teams. He didn't play in '07, just to be clear. I can't defend the Bison Staff on this one, it is entirely their fault. But I wonder why the league did not catch this when the names were submitted to them. Do they not have a list of players that are not allowed to play for various infractions that they have imposed? Again it looks like the guys in the trench have to pay for the mistakes of the pencil pushers. The rest of the team worked hard all season to get where they were, only to have it taken away. What about the injuries, that they indured throughout the season for nothing? Who will compensate them for that? And what about the players who were in their last year, how do you give them back their last chance to play for something they beleive in? Do you mind explaining the 7-year rule? Is it a football only rule? I hate to say it (because I run track in the CIS, and I should know all the eligibility rules), but I thought there was no time clock. They do have rules in place to ensure they don't have guys who play 5 years of junior football, then 5 years of CIS. I'm not sure there is anything as it applies to other sports; last season the RMC women's basketball team had a 34-year-old masters student playing. Football has had issues with the varying ages of competitors. O.K. I'm confused. I looked up on the internet, the Board of Directors Conference Call minutes, May 17th 2004. It clearly states (page 3) the CIS had four student-athletes serving four (4) year sanctions. Julian Hardy is mentioned as one of the four, then from Ottawa, and now, the Bison ineligible. Also named is Manitoba Bison Charles Bazilewich. Please note the date of his infraction was September 6th, 2002, whereas, Julian Hardy's infraction was October 24, 2001. Both of these players associated with the Bisons are mentioned in the motion made by Dubeau/Hoffman/carried. I felt real sorry for this woman on the T.V. clip associated with the Bisons' She is of the belief the player is not responsible? Did the player receive a letter from CIS? Was he informed after the ruling? What homework did the Coach do to determine his eligibility? The minutes are easy to find on the Internet for clarification. I'm puzzled by the media spin....what a mess....everyone suffers.